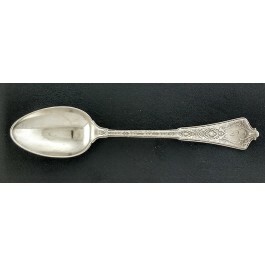 For your consideration is an Antique 1872 Tiffany & Co. .925 Sterling Silver Persian Pattern Ice Cream Spoon With Monogram 'T' in pre-owned condition. The spoon you will receive will show signs of wear and feature Tiffany & Co.'s patent 1872 Persian pattern crafted in fine sterling silver with the monogram 'T' on the handle. The spoon will measure 6.25 inches in length and 1.25 inches in width. Weighs approximately: 32 grams. The photos provided may not be the exact spoon you receive, however it represents the same product. You're reviewing: Antique 1872 Tiffany & Co Sterling Silver Persian Pattern Ice Cream Spoon 6 1/4"